Considered to be one of Bob Dylan’s strongest albums of the 1980’s, “Empire Burlesque” took a new approach both in the music and the production, using more modern technology and showing a conemporary sound that was unlike previously recorded albums. With notable songs such as “Dark Eyes” and “Tight Connection to My Heart” Dylan used this album to set the stage for his upcoming live performance tour in which he wanted to appeal to the masses rather than simply writing for himself. Although not considered a classic album, it definitely shows a different style of Dylan that has not been seen since. 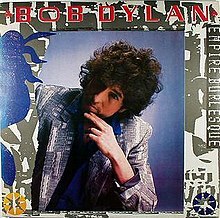 “Empire Burlesque” really did fit the 80’s style of music at that time, it lead Dylan into major tours with Tom Petty and other 1980’s bands that showed him for more of a pop singer. Vinyl. Bob Dylan: Empire Burlesque. First Edition LP. 1985. Record. 3 LP Vinyl: Neil Young Crazy Horse Reactor, Bob Dylan Empire Burlesque, Bad Co.
BOB DYLAN EMPIRE BURLESQUE L.P.
Bob Dylan - Empire Burlesque — Japanese Pressing! !